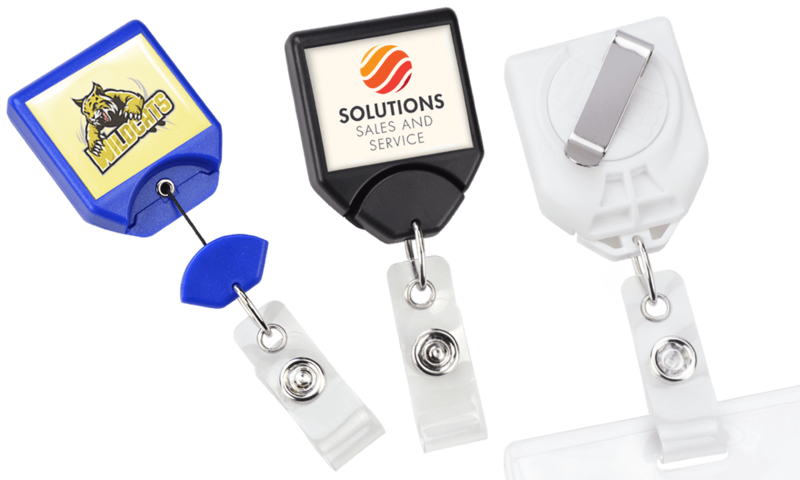 The B-Reel® badge reel features a unique front-loading design that ensures that your badge or card will always face front, eliminating the frustration that comes with tangles and backward-facing credentials. B-Reel is an excellent badge reel for staff who are required to have their badges facing front at all times. It has a mordern shape and and a swivel belt-clip. Printed domed label size: 30 x 25 mm. Retractable nylon cord length: 711 mm. Clear vinyl strap (to attach to your badge holder or ID badge). Add a full colour customisation with protective sparkyl dome on your twist-free B-Reel with clear vinyl strap and nylon cord. Back swivel belt-clip easily attaches to your clothing while it's no-twist design makes sure your badge always faces forward.